Allows your beverage to stay cold for 24 hours and at least 8 hours for hot beverages. Push-on two piece lid with Tritan™ swivel anti-spill closure, pinch the 2 axis joints slightly to remove the top part of the lid for easy cleaning. 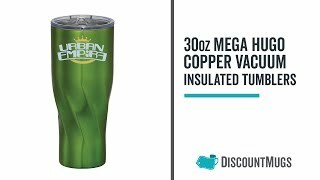 Complete your daily grind while marketing your brand through these Customized 30 oz Mega Hugo Copper Vacuum Insulated Tumblers. Produced with high quality stainless steel, these tumblers have double-wall vacuum construction with copper insulation. These feature allows maintenance of your drink's temperature for hours. Each tumbler was also designed with spinning geometric bottom making it more stylish and attractive. Bring more creativity to these tumblers by adding your logo on the imprint area provided. Personalize these tumblers now. Upload your logo or slogan. If you don't have any ready image, let our Design Lab help you. We have plenty of cliparts and fonts that you can use in your artwork. It is very easy to use and can show you a visual representation of how this item will look like with your artwork. Call us this instant to place your orders! Enjoy the lowest prices we offer and guaranteed 110% price match too!